High blood pressure, or hypertension, is a condition in which the force of blood against your artery walls is too high. Eventually, uncontrolled high blood pressure can lead to heart failure. In addition to blood pressure medications and lifestyle changes, red wine may be an appropriate supplement to improve your blood pressure. Before drinking red wine, consult your physician to make sure that the alcohol in red wine will not alter the effects of your medications. Drinking red wine regularly may increase your HDL, or high-density lipoprotein, states the American Heart Association. HDL is the "good" cholesterol that removes plaques from your arteries, thus lowering blood pressure. The effect of increasing HDL is from the alcohol in the red wine. Over time, this small increase in HDL can reduce the risk for cardiovascular disease. 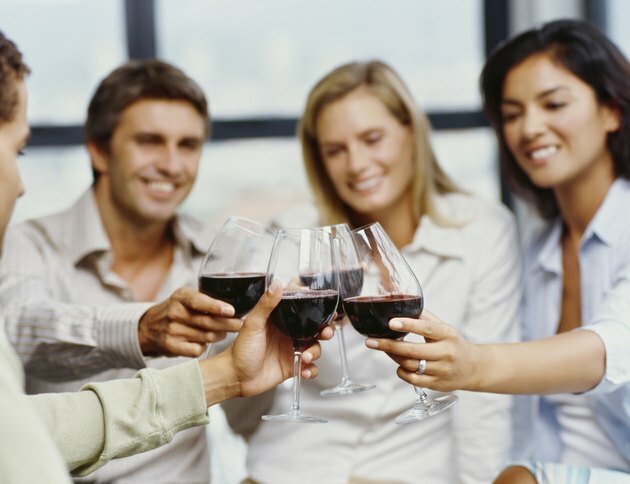 An added benefit of drinking red wine is that it may reduce blood clots, states the American Heart Association. Blood clots form when platelets clump together in the blood. Excessive blood-clot formation in the arteries can worsen plaques and increase blood pressure. Resveratrol is a polyphenol found in red wine that may have anti-clotting properties, thus reducing your risk for developing a blood clot and leading to a positive effect on blood pressure.